Simio is simulation software that provides a true object-based 3D modeling environment combined with scheduling functionality to help optimize the use of critical resources, and assess the risk associated with operational decisions. The platform allows users to construct their 3D model in a single step, and then instantly switch to a 3D view. All model-building products integrate seamlessly with Google Warehouse, allowing users to download from an extensive library of freely available 3D symbols to add realism to models. Simio’s cloud-based Portal Edition enables users to access powerful simulation processors for running various simulation experiments and generating plans. Users are able to publish and share simulation and scheduling results online, as well as create custom designed reports and interactive dashboards to communicate plan results. The Simio Portal assigns a separate processor to each simulation replication across all scenarios, enabling users to run simulation experiments in a shorter time. Major Simio features and applications include 3D modeling/animation, experimentation, analysis, and reporting features for defining scenarios, as well as material handling with on-demand/fixed route vehicles and accumulating/fixed conveyors. Scheduling features allow users to perform risk analysis in real time to help eliminate uncertainties and improve production safety from breakdowns, material shortages, or unplanned events. It is very easy when building simulation models to focus on the visuals and forget the analysis. After all, we need to convince the stakeholders that the solution we propose will deliver what it says on the tin and what better way than to mesmerise them with animation. Actually, there is another way, demonstrate that all scenarios have been considered and with an inflated chest lay down the challenge, "tell me where I have gone wrong and I'll tell you what data I need to determine whether its fact or fiction". Simio like most major simulation engines allows 3D visualisation and what is nice is a simple press of the '2' and '3' keys smoothly transitions you from 2D to 3D respectively. Add Google Warehouse and importing 3DSMax files and decent visuals can be shown. Developers please add STP or IGES file format. This simulation engine seems to have been developed with not only the ability to quickly model with little to no code writing experience, but also empowers one to devise and quickly run scenarios that can answer the real questions and find those sensitive areas/ optimal solutions. The start of any simulation project should start with the agreed conceptual model. This boils down to possible resources and a general set of inputs that trigger delays and produce outputs. Simio supports this basic concept in its standard library of objects. The object orientated approach means that these basic objects can be modified by adding more detailed lower level processes or modifying original logic. Of course the model is an object that can be imported into another model. Gaining model acceptance is generally easier with collaboration, so showing the team their input has been incorporated in a way that resembles the conceptual model goes a long way. The power of discrete event simulation is its ability to handle random events. Simio has the standard list of distributions which using a form of intellitype is easy to define. Note to developers, it would be great if intellitype is available in all fields. Of course with distributions come replications, which using the Experiments function allow the analyst to create and execute scenarios using different user defined input parameters and compare results based on user defined KPIs. But Simio has another trick up its sleeve, using the Input Parameters tab and defining the distributions with the sample size, provides a neat way to analyse the impact the distribution has on specific result parameters. Standard Library - Object Orientated approach to modelling means models can become objects in other models. Copy and Paste - Processes data, functions etc can be copied between models. Key Felds Data can be created like a database i.e. enter once use multiple times. External Data - Supports links with external data files such as CSV or excel. Easy Scenario Creation - Experiment function allows easy creation of multiple experiments and comparison of results. Standard Library - Object Orientated approach to modelling means models can become objects in other models. Copy and Paste - Processes data, functions etc can be copied between models. Key Felds Data can be created like a database i.e. enter once use multiple times. External Data - Supports links with external data files such as CSV or excel. Easy Scenario Creation - Experiment function allows easy creation of multiple experiments and comparison of results. Simio is an extremely powerful tool and it really makes one's life so much easier for simulations. Simio also does have a workbook that has lot of exercises that one can go through and learn a lot about the software. Once one has their head grasped around the concept, this software can save time, money, effort and provide accuracy.I absolutely love using Simio. It is such a powerful tool and it makes sense why the premium paid version is so expensive. However the biggest pro I see is that there is a free version that can be used which can help one understand the world of simulation. Simio has everything one needs to perform the complicated simulation process that otherwise would require us to write 100s of lines of code and make debugging difficult and daunting. I have been using Simio to do various distribution simulations such as uniform, exponential, triangular and so on and I don;t have to think how to do random number generation. Simio has so much more tool such as I love the reliability function where i can define what are likelihood of a machine failing and how much it would affect my throughput and productivity due to the varying repair times. The best part of Simio is that you can see the live simulation of your system in real time. Create a simulation for a M/M/1 queuing system to replicate a ice-cream store and watch how your customers arrival and service times affects your business. Fun part of simio is one can actually assing model entities with actual people and replace boxes with actual images which makes the presentation part of your system more engaging with the team. if you are a simulation guy/girl/business this software has everything one needs to validate, verify the architecture and answer questions that is not possible to be solved analytically. I absolutely love using Simio. It is such a powerful tool and it makes sense why the premium paid version is so expensive. However the biggest pro I see is that there is a free version that can be used which can help one understand the world of simulation. Simio has everything one needs to perform the complicated simulation process that otherwise would require us to write 100s of lines of code and make debugging difficult and daunting. I have been using Simio to do various distribution simulations such as uniform, exponential, triangular and so on and I don;t have to think how to do random number generation. Simio has so much more tool such as I love the reliability function where i can define what are likelihood of a machine failing and how much it would affect my throughput and productivity due to the varying repair times. The best part of Simio is that you can see the live simulation of your system in real time. Create a simulation for a M/M/1 queuing system to replicate a ice-cream store and watch how your customers arrival and service times affects your business. Fun part of simio is one can actually assing model entities with actual people and replace boxes with actual images which makes the presentation part of your system more engaging with the team. if you are a simulation guy/girl/business this software has everything one needs to validate, verify the architecture and answer questions that is not possible to be solved analytically. It is lot of work to learn this software and there are not much resources online readily available. Most resources are integrated to Simio and so looking at videos provided by Simio and reading the help section is the way to go. The free software however cannot simulate really huge simulation system and at that point one needs to purchase the paid version. getting around the software is daunting and there are lot of aspects one needs to know to figure out how to create their system. Deciding which type of simulation software for a business to purchase can be an extremely difficult decision. Being faced with this decision we began to investigate and compare simulation software packages available on the market. After comparison, Simio was the clear choice for our business. Although most simulation software packages are extremely difficult and confusing to learn, Simio's many resources make learning and mastering the software easy. Most noteworthy is the video tutorials provided which made the transition to Simio painless. Ultimately the decision to choose Simio was made based on the functionality of the software and the ability to accurately and quickly model real world systems for the purposes of finding solutions. Simio's 3D modeling abilities are unmatched by any other software packages available. Simio is quick and easy in the 3D department and compared to others is much less time consuming for similar 3D animations. With that said, the 3D modeling is generally a non-value added task and we were more focused on the software's modeling abilities. Simio's add-in packages operate flawlessly with OptQuest being the one we utilize the most. The customer support at Simio is outstanding too. I reached out to Simio when modeling a complex transit system this past year and they were able to identify my error and provided a fix the same day. We recently decided to expand our abilities with the usage of Simio's Risk-based Planning and Scheduling. After watching roughly 11 videos about 10 minutes each, Simio's RPS was easily incorporated into a previous manufacturing process project. Adapting the previous project slightly was straightforward and surprisingly resulted in the RPS being setup almost automatically. The ability to incorporate the complexities of variation into the RPS is what makes this such an advantageous tool and also what separates it from others. Simio also offers an add-in package for the RPS, Wonderware MES which provides the real-time production data. Generating plans, evaluating risk, performing comparisons, and many other functions are available through Simio's RPS and we look forward to providing this to our clients. We give Simio our highest recommendation. Company spends hundreds of millions of dollars each year moving equipment and supplies to offshore drilling units and producing assets. We use Simio to determine optimal vessel fleet size and develop 10 days shipment schedules daily. Tool works well and has enabled us to reduce our fleet size considerably.Handles highly complex simulations--we model 25+ slips, 30 vessels, 25 offshore locations, and more than 30 different types of demand product types such as barite, cement, casing, and baskets. Scheduler optimizes schedule based on lowest tangible and intangible costs and considers weather forecast, crew change schedules, and tank cleaning. Handles highly complex simulations--we model 25+ slips, 30 vessels, 25 offshore locations, and more than 30 different types of demand product types such as barite, cement, casing, and baskets. Scheduler optimizes schedule based on lowest tangible and intangible costs and considers weather forecast, crew change schedules, and tank cleaning. Simulation is written in a graphical programming language which is great for small, quick designs, but gets cumbersome to navigate in very large and complex simulations. SIMIO is an amazing simulation software program. The ability to model moving resources, tasks precedence and data modeling set it apart from many other languages.The ability to use data modeling to add intelligence to the entities is amazing. The task precedence ability is another feature where SIMIO stands apart. Finally the ability to model dynamic moving resources is another great feature. The ability to use data modeling to add intelligence to the entities is amazing. The task precedence ability is another feature where SIMIO stands apart. Finally the ability to model dynamic moving resources is another great feature. The feature creep of these objects has grown to out of control. The bloating of the objects has made it difficult to teach and modify them. So many properties and features. Their conveyor modeling is a little primitive. The ability to not set the controls in an experiment from a excel table with the all the optimization parameters for each control is a pain. Contact Simio for detailed pricing information. Simio provides the flexibility to model complex problems and rapidly evaluate alternatives to help maximize the impact of investments. The full-service solution helps improve processes and accuracy through the unified model for both facility design and planning and scheduling. Simio helps solve scheduling dilemmas with risk-based scheduling and planning, to stay ahead of the game and improve production schedule performance. The OptQuest add-on seamlessly integrates with Simio experiments and uses state-of-the-art algorithms to generate and evaluate scenarios. Experiment results can be accessed using a standard web browser, as well as touch screen mobile devices such as tablets and smartphones. Below are some frequently asked questions for Simio. Q. What type of pricing plans does Simio offer? Q. Who are the typical users of Simio? Q. What languages does Simio support? Q. 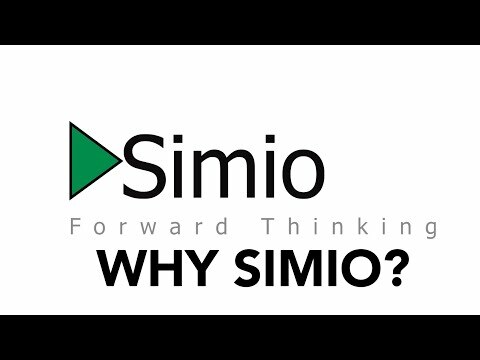 Does Simio support mobile devices? Q. Does Simio offer an API? Yes, Simio has an API available for use. Q. What other apps does Simio integrate with? Q. What level of support does Simio offer?